“The first week was all about showing us around the offices, and how people work here. 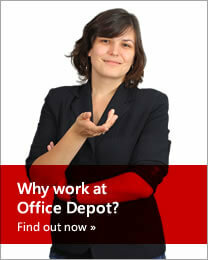 We attended different trainings where we learned all we had to do for the period we were going to work at Office Depot. The most exciting part of the whole experience implied the first phone call we had to make. I can easily remember the nervousness on everyone’s faces as we had to decide which one was going first. Then someone in the group broke the ice, made the first call and made things a lot easier for the rest of us. Later on we started the real work. Although I am still in high school, this experience made me feel like an adult with responsibilities. This job not only gave me the opportunity to improve my German language skills and earn my own money, but gave me the chance to meet a bunch of new people. Some of them have become my friends and I am sure that we will remain in contact long after the summer job is done. There were also moments of panic when we did not know how to help the client, but luckily there was always someone there to help us solve our problems. Our team leader did a great job and was always there in case we needed something. Another riveting thing was to get in contact with a wide range of clients. Some of them were polite, communicative and easy to talk to, while others were less in the mood to have a conversation or to pay their bills. Overall it is a good exercise to talk with different people in order to learn how to manage such issues in the foreseeable future. Lastly, I want to point out how important this experience was for me and my future. Thanks to this job I had the opportunity to see how people in this environment are and act, but also helped me to get more patient, devoted and responsible. To be honest, the first thought that popped into my mind when I first heard about the summer job at Office Depot was: working in that movie like building must be thrilling. Even though I have learned German since the second grade, I wanted to come to Office Depot to practice and improve my language skills. At my interviews I was both frightened and excited; of course I realized later that I should not have been frightened at all, but I should also mention that these were my first interviews ever. The most surprising thing after the fact that the HR girls and the manager were so nice and friendly (I first thought, with such a building, these people must be awfully serious and not fun at all…) was the fact that I really liked what I had to do: talking to people only in German sounded exciting and a good opportunity to develop myself.